Bonhams kicked off the concentration of Arizona Auction Week events with its Thursday mid-day sale at the Westin Kierland. From here on it was one auction after another, often several at a time, across the Valley of the Sun. In any event, fifteen 911s lined up along the fence at the Westin were a show. The model, particularly the early short wheelbase cars, has been on a tear for the past two years, regularly tearing up the Porsche pages in value guides and auction reports. The value trend seemed to fly in the face of Porsche production over the years. Aside from a few, special variants, Porsches were built in quantity, and consumed in quantity by a customer base that rarely abused them. The end result? 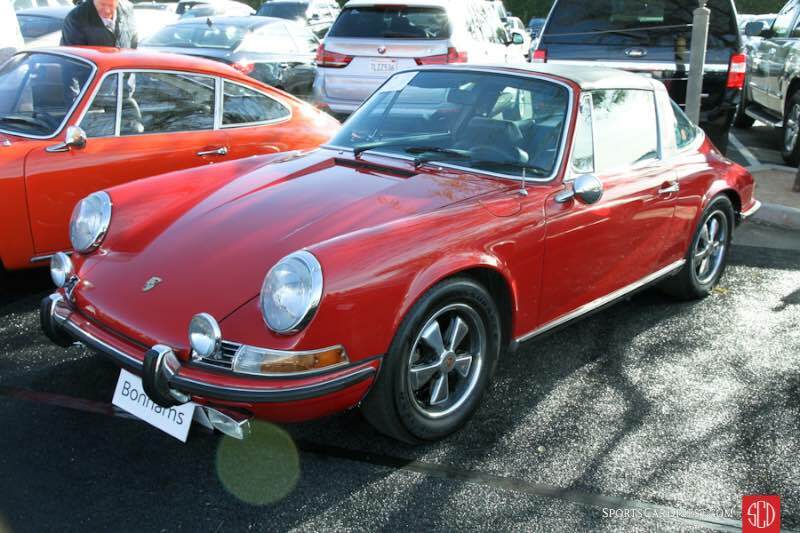 There never has been a shortage of used 911s in the marketplace. But with Bonhams Scottsdale auction that potential abundance may have been turned into real supply, which may have caught up with – if not surpassed – demand. All the fifteen 911s were sold but eleven of them brought hammer bids below the pre-sale low estimate. The four remaining were sold within the estimate range; none exceeded the high estimate. It was a pattern repeated across the other Scottsdale auctions, too, where a total of 66 911s were offered; none of them sold above their high estimates. Bonhams Scottsdale is about diversity and without a multi-million dollar headline consignment (something that was missing throughout most of the Scottsdale auctions this year as well) this was a more consistent, and more accessible, collection of cars than in prior years. So forgive an old guy’s (Scottsdale Friday was my birthday) infatuation with the beautifully restored Mercer Series Six Sporting, or our collaborator Andrew Newton’s fascination with the Riley RMB Drophead. It really was about cars that many people could like, and often aspire to own. Even Porsche 911s which might be seeing an adjustment to values that put them within reach of a wider but still enthusiastic base. Andrew Newton contributed some of the on-site observations and photos; the editor is responsible for the final content. 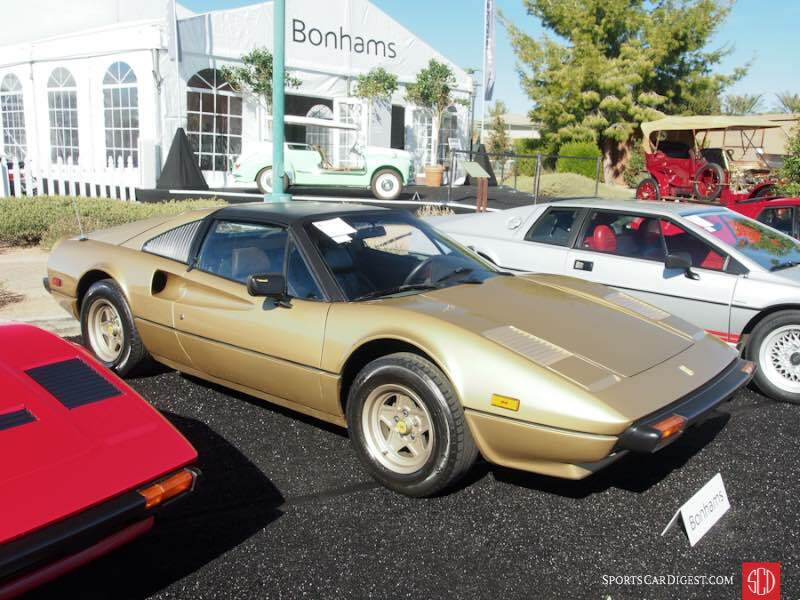 Lot # 4 1980 Ferrari 308 GTSi Spider, Body by Scaglietti; S/N ZFFAA02A0A0032621; Engine # F106B04000351; Oro Chiaro, Black vinyl roof panel/Brown leather; Estimate $90,000 – $110,000; Visually maintained, largely original, 3+ condition; No Reserve; Hammered Sold at $55,000 plus commission of 10.00%; Final Price $60,500 – Air conditioning, power windows, Alpine CD stereo. – Decent clearcoat repaint, chip guarded sills, good original upholstery, Clean repainted underbody. A usable driver in attractive and unusual Eighties’ colors. – Absurdly generously estimated but it seems to have achieved its optimistic end by encouraging the bidders to take it to this strong price for a mediocre car. Lot # 5 1962 Bentley S2 Continental Flying Spur, Body by H.J. 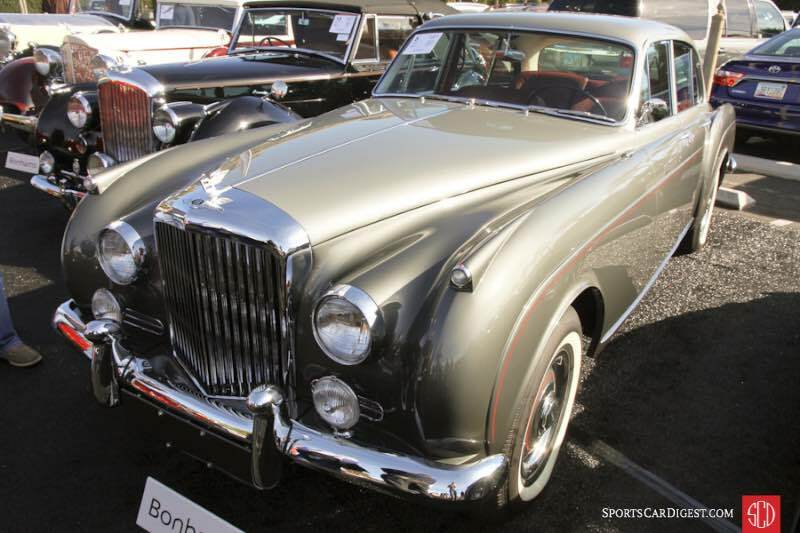 Mulliner; S/N BC59LCZ; Shell Grey, Tudor Grey/Red leather; Estimate $200,000 – $300,000; Recent restoration, 2+ condition; With Reserve; Hammered Sold at $205,000 plus commission of 10.00%; Final Price $225,500 – Wheel covers, American Classic narrow whitewalls, arm rest, column shift, Blaupunkt cassette stereo, Smiths dash clock, Lucas driving lights, power windows. – Even gaps. Excellent paint, chrome, interior and wood. Clean and restored underneath. An exquisitely presented Flying Spur in ideal colors. One of the more elegant four-door automobiles of the period and one of just 54 examples delivered in LHD. Straight body. Sold new in New York City and restored from 2012-14. – One of few cars in the Scottsdale auctions to sell on a hammer bid within the pre-sale estimate, a distinction generously supported by the quality of the presentation as well as the inherent quality and luxury of the Flying Spur. This is a result that is fair to the buyer, the seller and even the auction company. 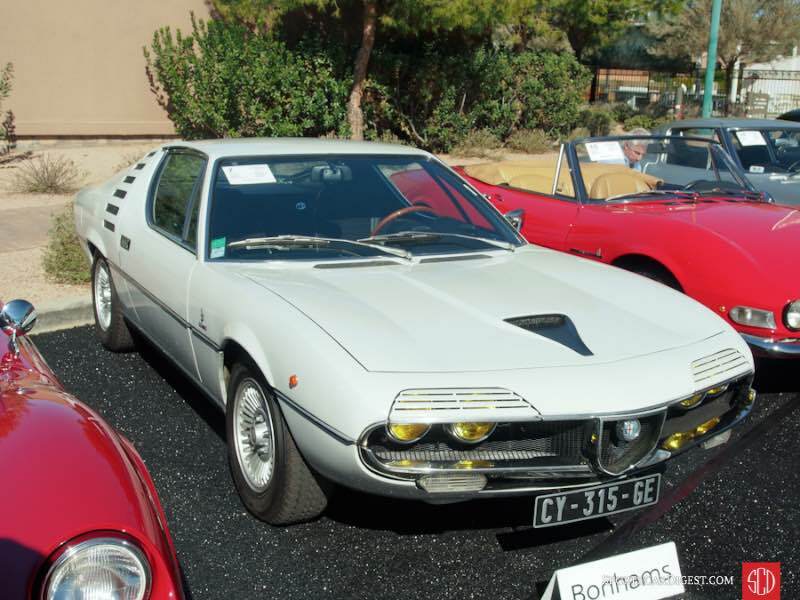 Lot # 7 1972 Alfa Romeo Montreal Coupe, Body by Bertone; S/N 1426759; Engine # AR0056401264; White/Black cloth; Estimate $60,000 – $80,000; Unrestored original, 2- condition; No Reserve; Hammered Sold at $70,000 plus commission of 10.00%; Final Price $77,000 – Good original paint, chrome, interior and engine compartment. Original undercoat in wheelwells. Clean and attractively maintained in very good condition – Sold for Euros 36,800 all-in by Bonhams in May 2013, $47,546 at the time. Cataloged as silver, it is so white it’s hard to mistake for silver, or any variant thereof. Its condition and three owner history were attractive enough to bring a good price, but still something of a bargain as Montreals begin to attract more attention. It’s a 4-cam 227hp V8 under that busy hood. 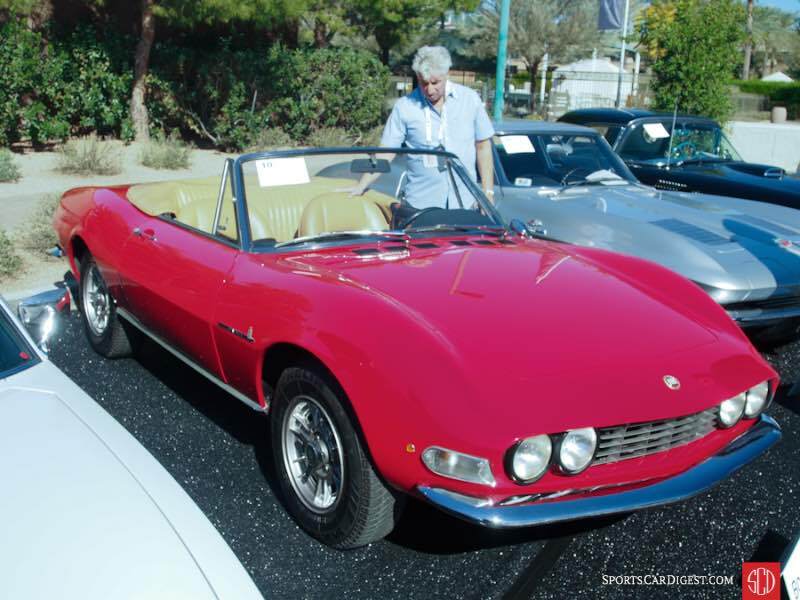 Lot # 10 1967 Fiat Dino Spider; S/N 135AS0000438; Engine # 135B000000488; Red/Tan vinyl; Beige vinyl top; Estimate $140,000 – $160,000; Visually maintained, largely original, 3 condition; With Reserve; Not sold at Hammer bid of $120,000 – Voxson AM-FM, alloy wheels, Michelin tires, Momo steering wheel. – Sound but erratically masked repaint, good upholstery. Uneven hood fit, original undercoat in the wheelwells. Sounds like a badly tuned lawnmower when it runs. A sound but mediocre driver. – Cars arrive for auction in all kinds of condition, frequently disappointingly prepared as this Fiat was. It’s no way to sell a car, particularly one that is expensive to get right, and the homework should have been done by the seller before it was turned over to the transporter. The fact that it was cataloged has having an engine rebuild in the last two years only adds to the problematic presentation. It is a miracle it got bid even to this level. Lot # 14 1969 Porsche 911S Targa; S/N 119310587; Engine # 6392043; Polo Red/Black vinyl; Estimate $135,000 – $165,000; Older restoration, 3+ condition; No Reserve; Hammered Sold at $150,000 plus commission of 10.00%; Final Price $165,000 – 1991/170hp, Bosch fuel injection, 5-speed, Fuchs wheels, Goodyear Assurance tires, gold brightwork, Becker Grand Prix radio, fog lights, tinted glass, glass rear window.. – Loose, wavy roof vinyl. Used, slightly dirty but presentable engine bay. Very good paint and interior. Believed to be a California car since new and with three owners and showing 94,508 miles. Fully restored in the early 2000s and used regularly since. Still very good and ideal for vintage tours and rallies. – This is an appropriate result for a fixed window, 5-speed ’69 911S Targa with a strong older restoration that is holding up very well. Of the fifteen 911s of various configurations and ages offered at Bonhams only another ’69 911S (coupe) and the RS 2.7 brought more and it is one of only four to sell within their pre-sale estimate ranges, continuing to evidence Porsche collectors’ infatuation with the early short wheelbase 911s. 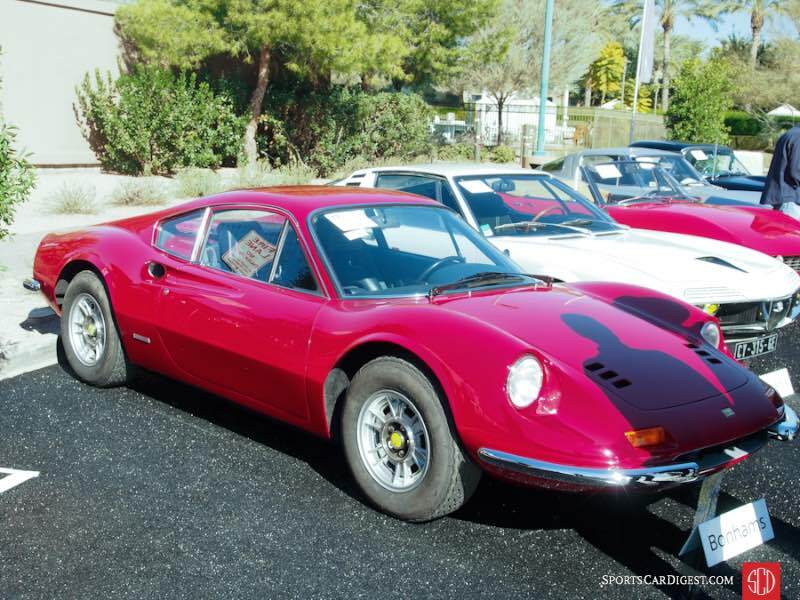 Lot # 17 1972 Ferrari 246 GT Dino Coupe, Body by Scaglietti; S/N 03314; Rosso Chiaro/Blue leather, Black bars; Estimate $350,000 – $400,000; Recent restoration, 2+ condition; With Reserve; Hammered Sold at $306,364 plus commission of 10.00%; Final Price $337,000 – Power windows, headrest seats. – Very good paint, chrome and interior. Clear, unmarked glass, new door seals, flush panel fits, even gaps. Sharp, clean engine compartment in showroom condition. Color changed during restoration from possibly unique Azzurro Dino/Black leather. – Offered by RM Auctions at Monterey in 1999 with a reported high bid of $70,000 and condition described as unrestored original and so well preserved it rated a nearly-showroom condition 2-. Since then its odometer has added 349 miles but the cost escalated substantially by the pile of restoration and color change receipts totaling $125,000. It is a sound value at the price it brought here but with originality so highly prized these days it could reasonably have brought all of this and more without spending more than a few thousand dollars on meticulous detailing and mechanical freshening. 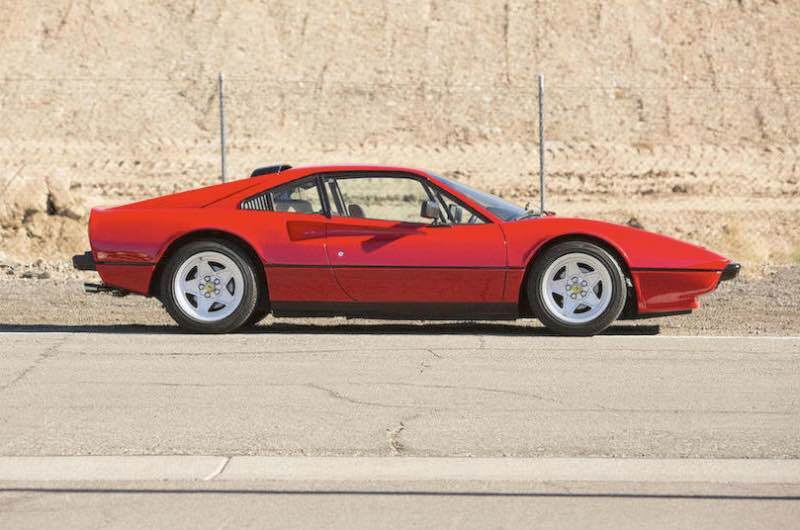 Lot # 20 1984 Ferrari 308 GTB QV Coupe, Body by Scaglietti; S/N 49461; Engine # 00059; Red/Tan leather; Estimate $100,000 – $140,000; Visually maintained, largely original, 3+ condition; No Reserve; Hammered Sold at $70,000 plus commission of 10.00%; Final Price $77,000 – Air conditioning, power windows, no stereo, chrome shift knob. – Good paint, lightly scuffed driver’s seat bolster otherwise very good upholstery. Cosmetically redone with new paint and interior a few years ago and appropriately maintained since. – Bought for a representative price. 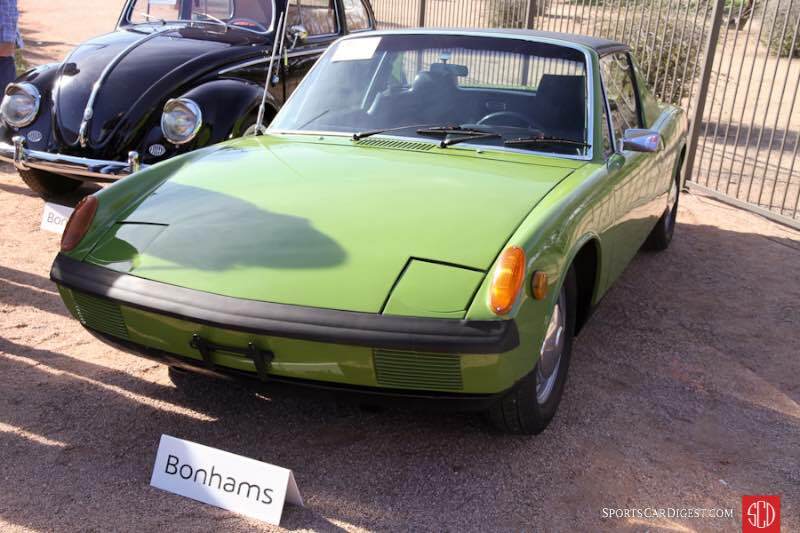 Lot # 22 1970 Porsche 914-4 Targa, Body by Karmann; S/N 4712908012; Willow Green/Black vinyl; Estimate $30,000 – $40,000; Visually maintained, largely original, 3- condition; No Reserve; Hammered Sold at $15,000 plus commission of 10.00%; Final Price $16,500 – Bosch fuel injection, steel wheels with hub caps, Bridgestone Potenza tires, AM/FM cassette radio. – Long, jagged scratch on the engine cover. Lots of masking errors around the front bumper. Big chip on the right front fender. Overspray in the wheel wells and on the suspension. Paint flaking off of the frame of the roof panel, and small cracks in the vinyl at the edge of it as well. Good, lightly worn original interior. Pitted door handles. Clean underneath. This could have been an impressive, preserved car kept dry thanks to a clean and dry existence where it was sold in Utah, but the distinctions of originality were ruined by a crude, rushed respray done in 2012. – Placed at the end of the photogenic line of Porsches during the auction preview, this car really didn’t fit in, not only because it’s a 914 but because its sub-par repaint really stood out among a group of overall really well presented 911s. Bonhams’ presale estimate of $30,000 – $40,000 was unbelievably optimistic, as this result, which is still a generous one, shows. It will not be easy or cheap to undo the tacky, poorly masked, repaint and at this price it isn’t financially feasible to try. Riley’s was races extensively in the early 30’s with good results, e.g. Le Mans 1933, where a 1.1L Riley Nine came fourth, behind 3 Alfa Romero 8C, and beating both MG’s, Aston Martins. At le mans in 1934 Riley’s occupied 4 of the first 6 places, finishing 2nd, 3rd, 5th and 6th. The same Riley engine, as fitted to the one in the auction, powered most of the early Healey cars eg. Healey Silverstone, and modified for use in the BRM grand prix cars, and they where among the first to introduce a twin cam OHV engine in midclass passenger car in 1927, which then with modifications where used until fifties. I would say that is more correct that Riley’s are an overlooked British mark, with a rich history. I concur that the comment minimizes Riley’s history, however it is, as you point out, largely overlooked and has little relevance in the post-WWII period, or to observers (and collectors) whose experience timeline largely begins post-WWII. Among great marques only Bentley has been able to perpetuate a pre-war competition history into the post-war era devoid of any substantial competition activity. There is a danger that significant marques/models will become overlooked but that creates an opportunity for astute collectors with a sense of history to pick up interesting cars at modest values and enjoy them while illuminating the uninformed about them.